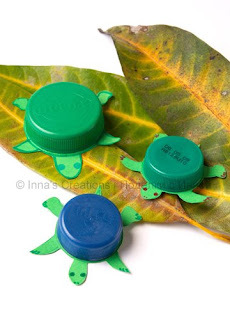 How to make toy turtles out of bottle caps: take a plastic bottle cap and a sheet of construction paper. Put the cap onto the paper and trace it around. That will be the turtle's body. Add a head, paws and tail. Cut them out, then just glue the cap onto the body. That's it. Try also making a few turtles of different sizes and stacking them on top of each other. Thanks for sharing a very cute idea...my playgroup families had a great time. We mounted them on painted paper plates that we used as the sea. Thank you, Susan and Taylor! I'm glad you like it. Hello Inna! That is a great idea. I made this kind of turtles but instead of bottle caps I used half of the walnut shell. I also made mice out of walnut shells, making the tail out of string.